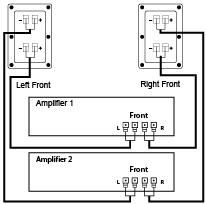 If your speakers are equipped with dual bi-wire / bi-amp binding posts, then you have the choice to connect them using the conventional method of a single set of wires to a single amplifier or you can choose an alternative method - either bi-wire (two sets of wires to a single amplifier) or bi-amp (two sets of wires to two separate amplifiers - one powering the tweeters and mid-range drivers and the other dedicated to the woofers). Here we will explain how to wire your speakers with 5-way dual binding posts. Axiom 5-way binding posts can accept 5 different wire terminations. In the illustration below we will explain how to connect the most common types. BI-WIRING: Remove the two gold bridging bars linking the two pairs of binding posts for the separate woofer and mid-range/tweeter sections of the crossover for each speaker. Connect two speaker cables--one cable to the upper pair of binding posts and one cable to the lower pair--for each speaker (four cables for two speakers). At your receiver or amplifier, connect the two cables to one pair of red and black output terminals for the left channel, and two speaker cables to the other pair of output terminals for the right channel. Always maintain the red-to-red (+ to +) and black-to-black (- to -) connection scheme for each channel’s speaker connections. BI-AMPING: To power your speaker with two amplifiers, remove the two gold bridging bars linking the two pairs of binding posts for the separate woofer and mid-range/tweeter sections of the crossover for each speaker. Connect one stereo amp to the lower set of binding posts on each speaker (the woofers), and the second stereo amp to the upper pair of binding posts (the mid-range/tweeters) on each. Adjust the level (gain) of each amp for equal output, unless you wish to change the spectral balance of each speaker.